By Thad Green, Ph.D. and Merwyn A. Hayes, Ph.D.
What motivates people to perform better? It’s three very specific things. Do you know what they are? Performance is the sum product of the team, but only by managing the individuality of team members is top performance achieved. There is a proven, highly effective methodology for managing the individuality of employees. Do you know what it is and how it works? Managing and leading in today’s workplace is too complex and demanding not to share the responsibilities with those best equipped to assist – the team. But, getting direct-reports involved in solving their own motivation and performance problems, and sharing the responsibilities of management, calls for special managerial skills. Do you know what they are and how to employ them? 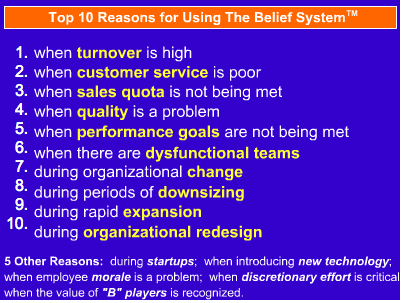 To find the answers to these and many questions you never though to ask about motivation and performance, get familiar with The Belief System.